Puri su Surf Resort is the ultimate Surfer’s Paradise. Puri Asu Resort offers a peaceful sanctuary to those who are looking to escape the typical, mainstream, highly commercial holiday resort. Free from the stress and hassle of the typical vacation, Puri Asu Resort is a slice of paradise. It’s located on a pristine white sand beach, among coconut trees, crystal clear water and perfect waves and situated on a remote island only one degree above the equator. While staying at the Resort, you can enjoy the best in comfort and privacy along with easy access to some of the best and most consistent waves in the world. Beach Distance right on the beach! Puri Asu Resort offers an unforgettable holiday experience, with high-quality facilities and a huge range of activities to keep you entertained. • Most consistent waves region in Indonesia. • Beach front Yoga gazebo. • Surf view private gazebo. • Fitness and yoga gazebo. • All rooms have air conditioning units. • Unique Sunrise, beach front. • Western standard bathrooms with hot water showers. • Family-friendly and suitable for children. • Waves for all levels of surfing. • Jetski for Tow-in and water safety. • Four boats for all guest needs. In 2017 we are proud to offer our brand new luxury accommodation. 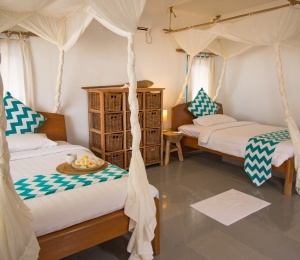 The three 2 bedroom two bathroom private villas are now available for our guests. We had a team of builders from Bali come all the way to Asu to construct these special units. We guarantee this is the finest accommodation in North Sumatra. This unit is ideal for families with children or friends travelling together. Only 15 meters from the waters edge, you will fall asleep to the sounds of the waves and even know when the swell is rising or dropping. Our original building, this house was built in Palembang South Sumatra and brought in pieces to Asu Island. Sitting 2 meters above the ground it stays cool and comfortable. This is recommended for single travelers and groups of friends. * Please Note that all guests receive the same service regardless of the type of room accommodation they choose. 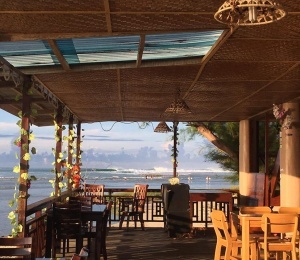 All meals, boat surf transfers are equal among all of our guests. Puri Asu resort offers you the best waves of your life. The Hinako’s Islands are one of the most consistent surf destinations in the entire world. Its broad exposure towards the southern Indian Ocean provides these islands with consistency and high quality waves. There is no other place on the planet which offers high quality surf and no crowd! There are five waves strewn throughout the islands, in maximum range of 15-30 minutes and two more 40-50 minutes by speedboat. 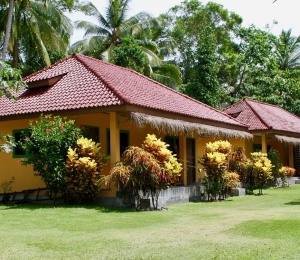 The Puri Asu Resort is determined to help you get the most out of what the Asu Island has to offer, while still giving you the convenience and comfort of coming home to your own private, clean bed every night. SURFINN © 24-04-2019 04:31:01. ALL RIGHTS RESERVED.